1U.S. Geological Survey Geomorphology and Sediment Transport Laboratory, Golden, Colorado. 2U.S. Fish and Wildlife Service, Grand Island, Nebraska. *The findings and conclusions in this fact sheet do not necessarily represent the views of the U.S. Fish and Wildlife Service. Rivers are conduits for water and sediment supplied from upstream sources. The sizes of the sediments that a river bed consists of typically decrease in a downstream direction because of natural sorting. However, other factors can affect the caliber of bed sediment including changes in upstream water-resource development, land use, and climate that alter the watershed yield of water or sediment. Bed sediments provide both a geologic and stratigraphic record of past fluvial processes and quantification of current sediment transport relations. 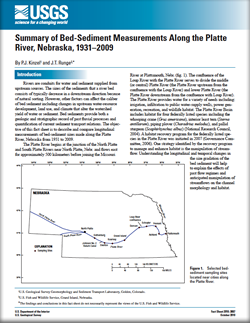 The objective of this fact sheet is to describe and compare longitudinal measurements of bed-sediment sizes made along the Platte River, Nebraska from 1931 to 2009. The Platte River begins at the junction of the North Platte and South Platte Rivers near North Platte, Nebr. and flows east for approximately 500 kilometers before joining the Missouri River at Plattsmouth, Nebr. The confluence of the Loup River with the Platte River serves to divide the middle (or central) Platte River (the Platte River upstream from the confluence with the Loup River) and lower Platte River (the Platte River downstream from the confluence with Loup River). The Platte River provides water for a variety of needs including: irrigation, infiltration to public water-supply wells, power generation, recreation, and wildlife habitat. The Platte River Basin includes habitat for four federally listed species including the whooping crane (Grus americana), interior least tern (Sterna antillarum), piping plover (Charadrius melodus), and pallid sturgeon (Scaphirhynchus albus). A habitat recovery program for the federally listed species in the Platte River was initiated in 2007. One strategy identified by the recovery program to manage and enhance habitat is the manipulation of streamflow. Understanding the longitudinal and temporal changes in the size gradation of the bed sediment will help to explain the effects of past flow regimes and anticipated manipulation of streamflows on the channel morphology and habitat. Kinzel, P.J., and Runge, J.T., 2010, Summary of bed-sediment measurements along the Platte River, Nebraska, 1931–2009: U.S. Geological Survey Fact Sheet 2010–3087, 4 p.